Long lines and interesting discussions awaited the visitor at this year's FOSDEM event in Brussels, Belgium. Apparently, not even the FOSDEM team can guess which topics will attract a large audience and which will not, despite many years of experience. The result: Long lines formed before some rooms at FOSDEM'17, the largest European FOSS community event, which was held in early February 2017. The fast campus LAN closed the breach for those waiting in line this time, however. The organizers broadcast live streams of presentations from all rooms by building their own content delivery network, proving that FOSDEM is in good shape in terms of hardware. Many of the videos are now online . Buses and trains were running again, in contrast with the previous year, but visitors seem to like FOSDEM the way it is – including the beer event on the evening before the headliner. The organizers can only roughly estimate the number of visitors (about 8,000) because they do not sell tickets. According to estimates by co-organizer Gerry Demaret, once again more people visited the event in the current year than in the previous year. Demaret has been part of the organization team, which has done without advertising since 2005. Introducing innovations is difficult, he notes, with just 15 to 20 main organizers, with which they have achieved a kind of "equilibrium." The team takes special care to learn from the mishaps of previous years. In general, the FOSDEM organizers adopt an evolutionary approach and do not make any long-term plans. Although some visitors remained almost entirely in individual dev rooms, an interested audience struggled with the challenge of visiting all the interesting talks. The program not only made admins and developers happy, it also offered the rest of the community exciting and entertaining insights. For example, Curl creator and maintainer Daniel Stenberg, describing the side effects of his "fame," notes that Curl  not only runs worldwide on almost any device you can imagine, but his email address also show ups everywhere in the license agreements. Every now and then, he thus receives dubious messages from people who believe he is either a hacker or the inventor of the multimedia system in their Toyota (Figure 1). 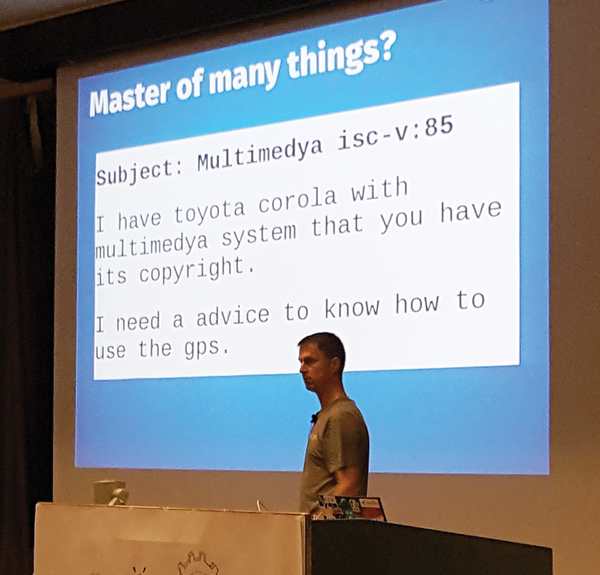 Figure 1: Among other things, a Toyota driver wanted to know from Curl inventor Stenberg how the GPS system in his car worked. Richard Brown chose a rather unusual start to his talk by presenting the Windows 95 architecture as the opening slide. This was the sys admin and SUSE employee's method of pointing out the problems with the new package formats (e.g., AppImage, Snappy, Flatpak, etc. ), which in his opinion are repeating some mistakes made by later Windows versions (and more specifically Windows 2000). The new Linux container formats dump the packaging work on the developer, criticized Brown, and only seemingly solve the problems of compatibility and portability. His point: Not all distributions adhere to the Linux Standard Base (LSB) ; therefore, a containerized app might be missing dependencies – "might" being the operative word. At the end, he admitted that the makers of the container formats do not conceal this, and stated: "It works, but this is one big pile of work." Work that the distributors usually do, reiterated Brown, who was reporting from their perspective. At times, it sounded a little like SUSE was worried about its business model, although Brown repeatedly assured everyone that the new formats would save the distributors some work. Without dismissing all of Brown's criticisms, most app developers have a different assessment of the new formats, as posts by Linus Torvalds and Dirk Hohndel suggest . The two kernel developers are working on a diving application and like AppImage because it supports simple distribution of the app to all distros. This is difficult or impossible using the classical approach, because the application presupposes libraries that are not (yet) on-board with the distributions. Although progress is too slow for some, Linux is evolving far too quickly for others. Gerolf Ziegenhain is working on software for air traffic control. His company focuses on Linux, which has not always been easy, because the software needs greater continuity than Linux and its ecosystem can offer. They have thus adapted the software with all sorts of tricks of their own. From the air traffic control perspective, the Linux community is much like the Gallic village community of which Asterix and Obelix  are a part. Ziegenhain explained how the company still managed to meet the numerous requirements for this kind of software. His conclusion: Building mission-critical systems with Linux is possible.